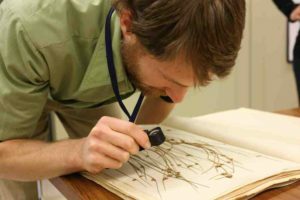 The Society of Herbarium Curators Membership Committee is excited to announce the first official Section of the SHC: the Early Career Section. Herbaria worldwide continue to attract new students, postdocs, and other professionals, and these newest members of the herbarium community join us with novel ideas, unique skills, and particular needs. The purpose of this Section is “to support the mission of the Society by empowering students, postdoctoral researchers, and early career professionals for success in herbarium settings” (ECS Constitution). In practice this could mean, for example, addressing training and professional development needs of early career professionals and leveraging new ideas to find innovative research and outreach methods. All members of the SHC interested in furthering the purpose of the section are encouraged to become a member of the Early Career Section at no additional cost to regular SHC membership. Students, postdocs, and early career professionals are especially encouraged to run for one of the five officer positions: President (one-year term, followed by one year term of past president), President-elect (one-year term, followed by one-year term of president and one-year term of past president), Secretary (two-year term), and Professional Development Officer (two-year term). More information about how to run for election can be found online. Early career professionals have much to learn and much to offer. We believe providing a dedicated section to focus on early career professionals will strengthen the future of herbaria, and we look forward to the good work this section will produce with strong support from the existing SHC membership. Look forward to more details about the Early Career Section in 2018!